Ok Gen X's, you will love this one. Stuart Membery remember him? Australia’s golden boy of fashion it’s safe to say he was a "fashion influencer" way before the term was even adopted by millions of bloggers. Known as The golden boy of 80’s Australian Fashion, he totally dominated the streets and catwalks of that time. For the gen Y's, Millennials and Z's it's never too late to learn about this fashion icon, go to Stuart Membery fashion . He was also The Brainchild for the rebrand of the US T-shirt line sweet baby jane which became the global success @espirit. This full circle skirt is a Stuart Membery original from the 80s and like all good designs they never date. 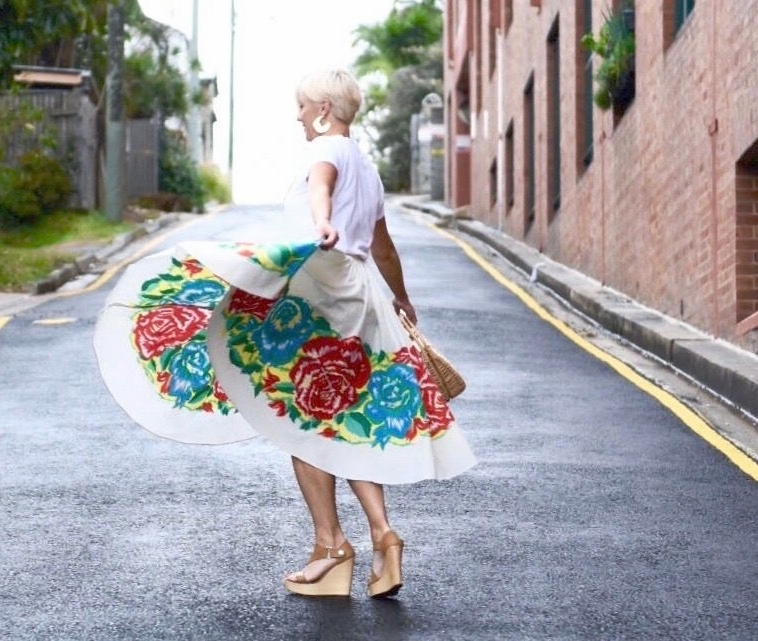 Pinterest also concurs circle skirts have never left the catwalks or the streets. This skirt is from the @dreamvintage4005 @commercialrdantiques . I love Vintage fashion buying as you never know what super trendy treasures you'll stumble across and it's one of the best ways to be a sustainable fashion buyer. What I particularly love about a full circle skirt is they can create the illusion of an hourglass shape. And speaking of body shapes who struggles to find clothes that flatter you? It can be really tricky these days as cuts and sizes can be hit and miss. Hence why having a body shape assessment can be like seeing for the first time. Head to my styling services and let me help you rediscover your body shape and confidence. I am honoured to be showing you this epic piece of Australian fashion history. If you have a bit a Stuart membery hiding in your wardrobe, I'd love to see you styling it! Mention me @sustainablesyling and tag @sustainablestyling .if we aren't friends yet let’s connect now . The definition of Joy is a full skirt, 80s fashion and a bit of Depeche Mode!